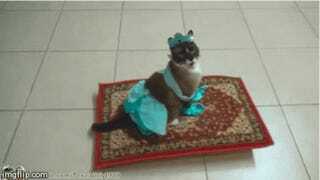 Cat dressed up as Princess Jasmine on a magic carpet is winning Halloween, so far. We dare you to watch this adorable fur baby glide around on a magic Roomba carpet without screaming, "Tell me, princess, now when did you last let your heart decide?" This 13-year-old "snowshoe cat" named Max-Arthur is killing it as Princess Jasmine. Uploaded via YouTuber TexasGirly1979, this Halloween presentation was a part of America's Cutest Pet – Howl-O-Ween. You may remember Max-Arthur's previous work as a Shark riding a roomba.